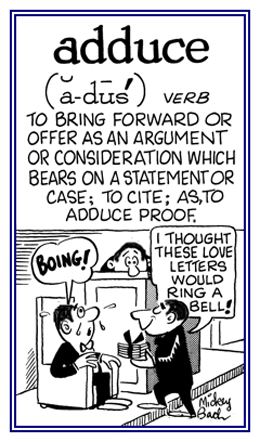 Offer as a reason in support of an argument; cite as pertinent, conclusive, or persuasive: At least the speaker did adduce three reasons for his actions. 1. Reach a conclusion by reasoning: Based on the forensic evidence, the police officer was able to deduce that the criminal was a man. 2. Trace the course, descent, or origin of: Based on Rhonda's conversation, Floyd could deduce that she had come from a large family. Because the officer was able to adduce an explanation for the accident, the judge was able to deduce who was responsible.